The Metropolitan Airports Commission, which operates MSP, is excited about how the unique concept has fared since its June debut. "This project has allowed us to create an ambiance and a feeling like you've never quite experienced in an airport before," explains Liz Grzechowiak, assistant director of Concessions and Business Development. "We wanted people to transcend from the busy concourse...into what feels like an urban landscape. And it's been received extraordinarily well." Of Note: The food trucks were refurbished/built off site & installed through a temporary opening in the building created during a separate window replacement project. Airside cranes lifted the trucks to the opening, then crews pulled them inside & pushed them through the concourse to the installation site. Total development cost was $3 million, and the new concession is expected to generate about $5 million in revenue during its first year. Notably, MSP's 4,000-square-foot Food Truck Alley occupies a nondescript area that otherwise had limited development potential due to its narrow width and lack of depth. When considering options for the oddly configured space, the airport chose to follow a national trend of "experiential retail," explains Grzechowiak. Although they require less square footage than traditional vendors, the food trucks are expected to generate similar financial results-and they offer customers a unique experience, she notes. Three of the trucks focus on food; the fourth serves beer, wine and other drinks from a full-service bar with built-in seating. The airport also added a separate 1,200-square-foot seating area with room for up to 93 guests just outside the narrow alley. Like the typical design of outdoor food truck courts, MSP's seating includes long community-style tables. In the truck/ordering area, ceiling tiles include small twinkling lights to create an outdoor evening feel, and strings of bare bulbs zigzag overhead to reinforce the casual alleyway vibe. "It's got something for everybody," says Grzechowiak. "We have a grab-and-go area, 'counter-to-go' service, sit-down service and a full bar. Most concessions have elements of that, but this is true to a food truck experience that you would have streetside. You can walk up to the window, order your food and pick it up and leave; or you can eat in our faux alleyway and sit beneath the café lights and order a beer." MSP partnered with three local brands-Red Cow, Salty Tart and Holy Land Deli-for the food. Red Cow also operates the bar truck. The airport released a request for proposals in March 2015, and Midfield Concession Enterprises began designing the project in February 2016. 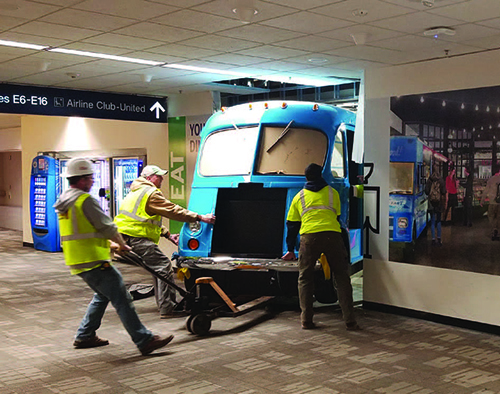 Samir W. Mashni, vice president and general counsel for Midfield, considers MSP's indoor food trucks a game-changer for airport concessions. "It is innovative and cutting-edge," says Mashni. 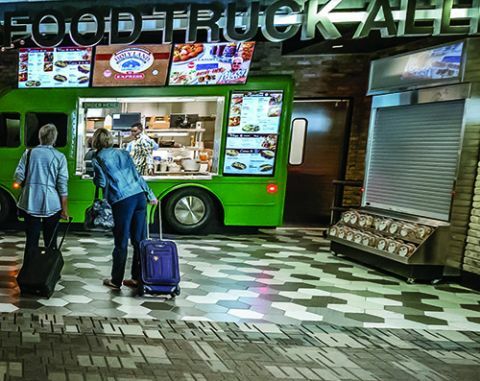 "This concept seized on a food trend on the street that was very popular with Millennials, and we at Midfield Concession Enterprises are always interested in setting a new standard by bringing new designs and new concepts to airport food and beverage dining." 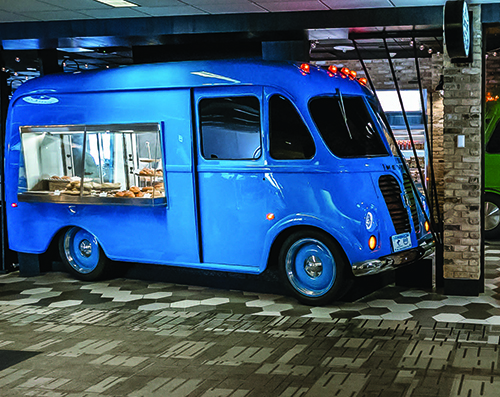 Midfield contracted Chameleon Concession, a Twin Cities firm that specializes in building food trucks, to procure the appropriate vehicles and modify them into revenue-generating venues for the airport. 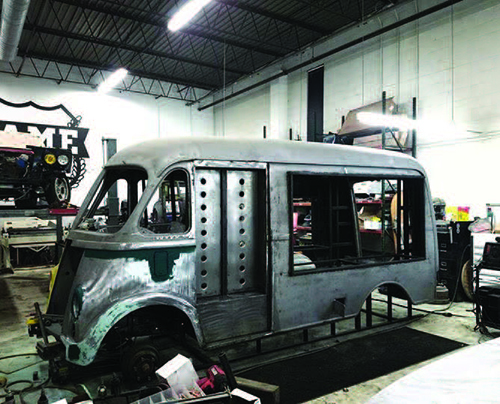 The company tracked down two vintage finds-a 1952 Ford camper and a 1960 Metro originally used to deliver milk and bread-and also purchased the shell of a new Airstream travel trailer, which was used to create one food truck and the sit-down bar. "It was important to source the vehicles to fit the footprint and layout of the space we were going to use," notes Mark Palm, president of Chameleon. 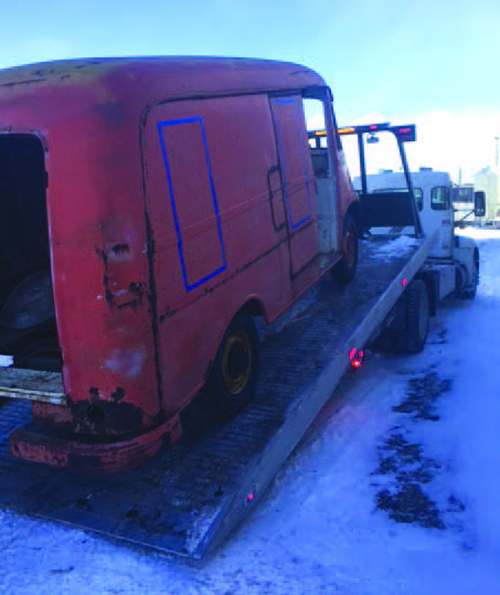 Crews thoroughly cleaned the vintage equipment and stripped interior and exterior mechanisms (including wheels) off all three vehicles. "The older trucks came through in pretty bad shape-they had been sitting in a farm field," explains Palm. 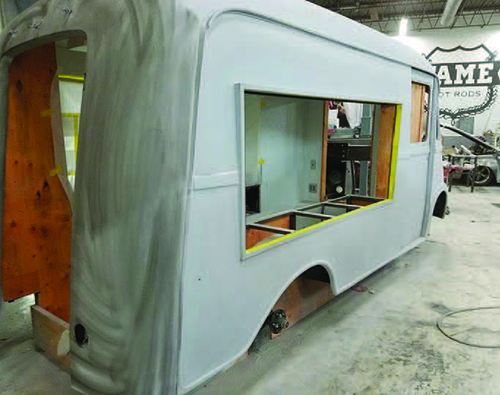 Because MSP's trucks wouldn't have to drive from location to location like their outdoor counterparts, crews split the vehicles open to create an attractive façade on the front and extra room in the back for equipment and personnel. "We had to be very careful with the structure when we cut them in half," Palm recalls. "We had to cut and reframe them all." 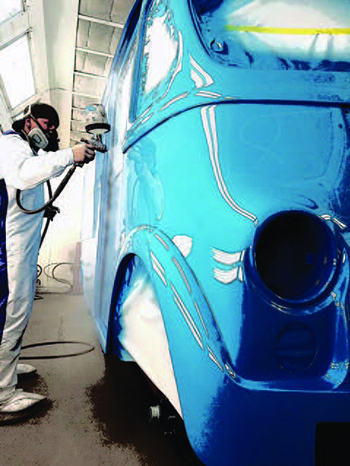 Crews then repainted the trucks and installed new headlamps, windows, grills and other accessories. Because the company had previously created numerous food trucks for street side use throughout the country, Palm was versed in food safety regulations and health department codes for the build-outs. Ensuring that materials conformed to airport fire codes was a new twist. Getting the completed trucks into the terminal was a challenge in itself. MSP coordinated installation of the large prefabricated units with a previously scheduled project to replace windows in the same concourse. After crews removed the old glass panels, workers brought in the food trucks before the new windows were installed. 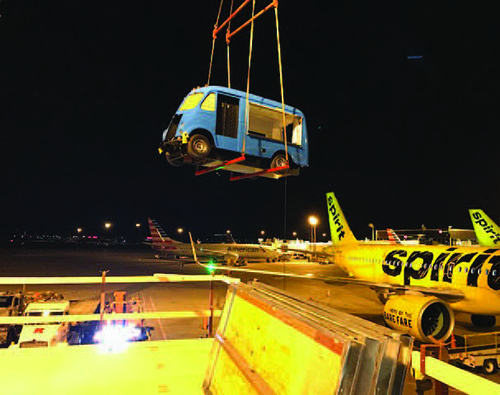 Flatbed trailers delivered the food trucks to the airside of the building and cranes lifted each one onto a temporary deck outside the temporary opening in the building. "The opening was 16 feet off the ground," Palm explains. "We built the deck from the tarmac all the way to the top window. When the flatbed came in and hoisted the vehicles up, we placed them on the deck and pushed them through. There was no other way in. We just pushed everything through the window opening and into the concourse." After the trucks were inside, crews maneuvered them through the concourse to the installation site and workers closed up the opening with new window panels. Work was completed at night, when the airport was closed. Deciding which brands to feature in Food Truck Alley was not difficult, reports Mashni. "All three vendors are very popular in Minneapolis and represent every food and beverage category that travelers would want in this type of concession space-burgers, salads, sandwiches, pastries, ethnic and healthy food, and alcoholic beverages." Red Cow specializes in hamburgers; Salty Tart offers sandwiches, salads and pastries; and Holy Land Deli caters to customers looking for international options. Grzechowiak notes that the airport originally planned to rotate in new brands, but that idea has been placed on the back burner due to the popularity of its original selections. "The powerhouse of brands that came through are really Twin Cities' institutions," she explains. "We are so successful with this lineup that we won't cross that bridge until we come to it." Together, the four trucks are expected to generate $5 million in sales their first year, with 5% annual increases thereafter, reports Mashni. "Travelers are very interested and intrigued by the innovative design and the options provided in this Food Truck Alley," he observes. "We constantly see people posing to take pictures next to the trucks." Grzechowiak credits Midfield for executing the airport's vision accurately and for going the extra mile during the project. "They did an exceptional job with selecting materials," she specifies. "It has an industrial look and is very much on trend. "Midfield was genuinely enthused about the opportunity to do something so unique in an airport environment. We are very pleased with the result, and so is the concessionaire. For a concourse location that is not in our main mall area, it's performing in the top of its class."